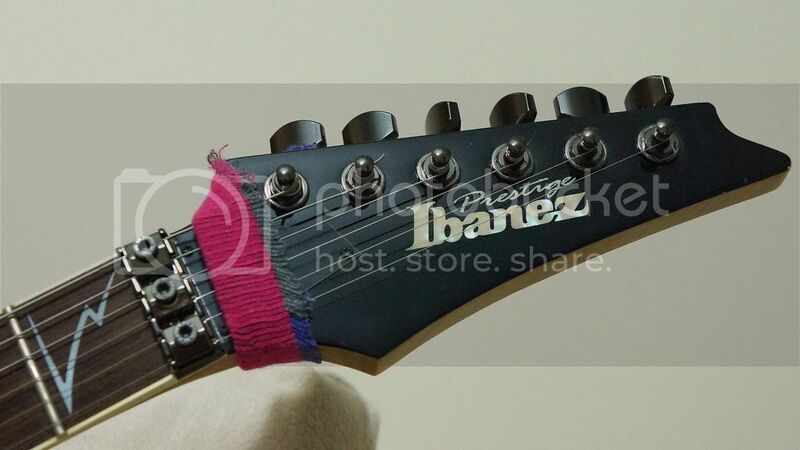 Re: Post pics of your own Custom modded Ibanez. I always loved the design of a RG. But i want some kindo vintage inspiration on it, sometimes. Hoseki and Rtowell73 like this. I guess I could post mine. An RG760 which was spray painted by previous owner. Now hidden with a tape which I thought would be a temporary solution but I've kinda grown to like it. Most fun part is that my 1-year old who's Lego's I got the idea from is trying to grab them from the body while I play. 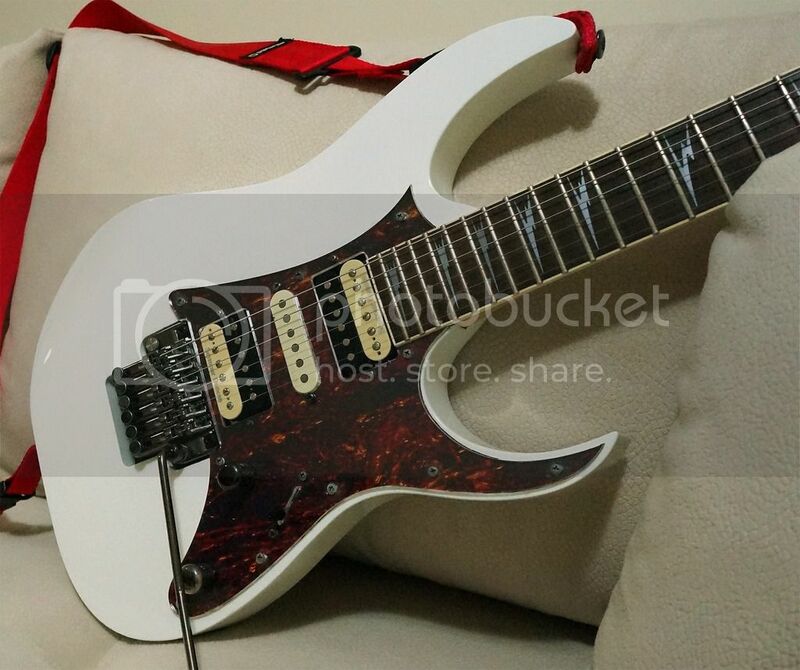 It is currently stock except for the pickups which are an EMG81 in the bridge and some unknown EMG's in the middle and the neck. I re-finished the back of the neck to a satin finish and gave the frets a little rub while I had the body taped. Embarking on some further mods. Despite the original looks, under the hood it's reasonably modified. The edge zero 2 trem / zps has been fettled and works beautifully, the sustain block has been replaced with a heavier unit and the wiring has a twin tone cap mod. 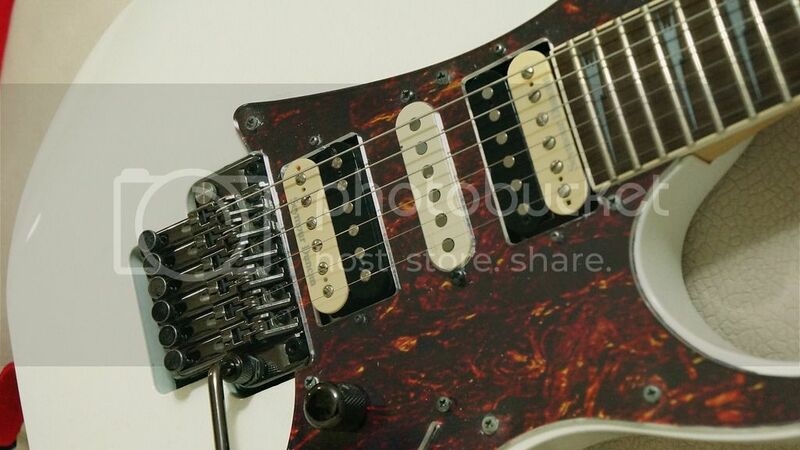 I'm trying to find a black pearloid pickguard for this 2016 RG350DXZ DVM - and a middle single coil preferably with a chrome bobbin or pickup cover, that isn't a shrieking angry pixie. Can anyone suggest? Perhaps something that has worked for you. Not a shredder pickup, more of a traditional strat middle, but with a little more upper-mid poke. for now.... this is it - suggestions welcomed. My vintage 1987 RG550 with a Tone Vise Pitch Shifter installed on the Original Edge tremolo. Last edited by Tejaus; 12-06-2018 at 09:00 AM. jono, peromucho7, Leviathus and 1 others like this. Last edited by Zoot; 11-16-2018 at 05:17 AM. ^Wow, what a post. I think that lemon/lime UV with the mirror guard is my favorite, perhaps even of all your builds. Cheers. Just added a few more. My humble RG550XH. Dimarzio Tone Zone and Chopper, changed the bits to red and painted the pickguard with ruby red nail polish as that was the reddest paint I could find. Great guitar for not much coin! peromucho7, mike570, Hoseki and 1 others like this. * First of all, pickup replacements: Dropped in a DiMarzio Tone Zone in the bridge position and a DiMarzio Liquifire in the neck position. I kept the single coil Infinity there because I really like its sound in the split positions. Almost piezo-ish in clean setups and somewhat strat-ish in dirtier setups. * Replaced all the electronics for CTS components. You know, the good stuff you can get from Stewmac. * Replaced the black metal knobs with strat-type black knobs. I really like how thew look on the Jems, the old JPs and those awesome new Marco Sfogli's RGs. 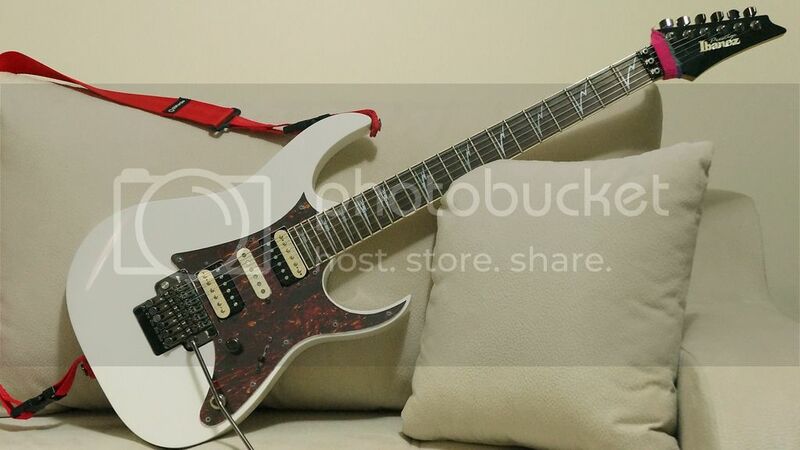 * Now, the neck: I found on ebay a Wizard II neck from a 2011 S420. 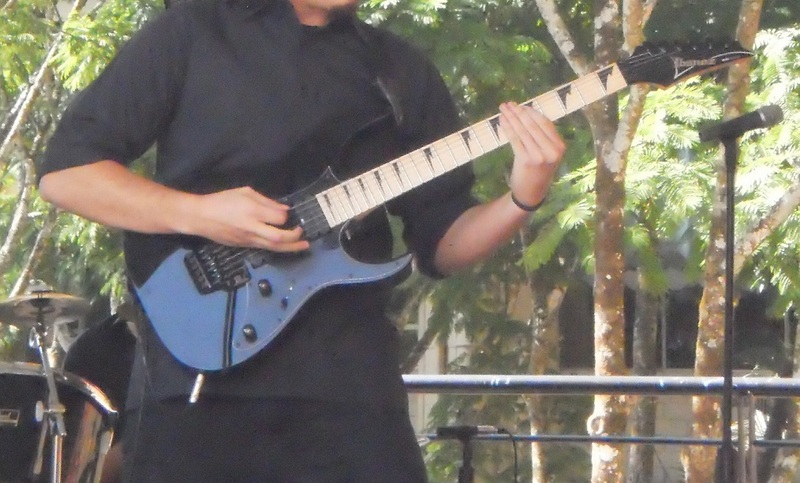 I really liked the fact that it had no fret markers but the ones on the 12th fret, and its rosewood fretboard. Quite a 180 degree change in the looks considering that this guitar had a maple fretboard with sharktooth inlays in it. I was pretty sure that this neck was going to be a direct swap as well: same production year, same Indonesian factory, same neck model. 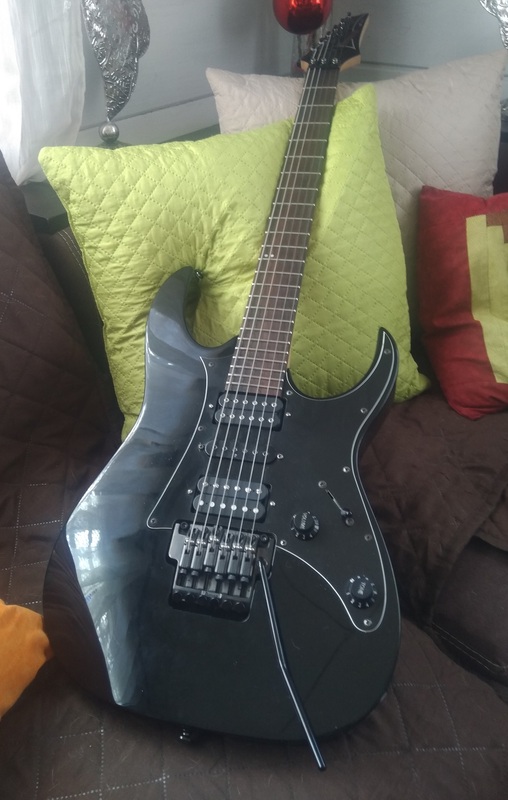 So I ended up purchasing it and getting stainless steel frets in it, the guy that did the job also put stainless steel screws in the locking nut, very nice of him. * Finally, I got rid of the Edge III bridge and got an Edge Pro in there. peromucho7 and Hoseki like this. 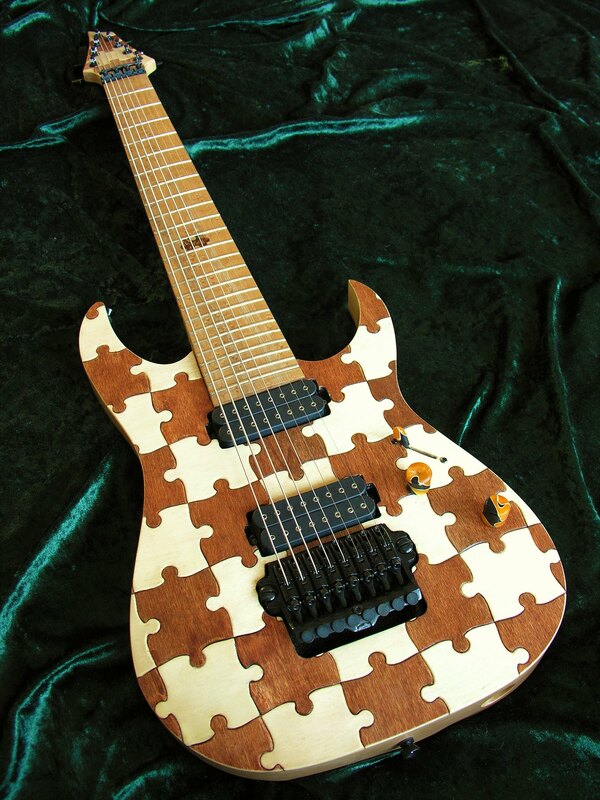 I was tired of the sharktooth inlay and the overall "way too high school metal band" guitar looks of it. Nice job, especially the neck and bridge swaps! Hey, how do you like the pitch shifter? I'd never seen one of these before and would like to get one if they work without any additional troubles. This is my sleeper Prestige. Titled Mr. Hyde. I can't even tell you what model prestige at the moment. It's been so long since I bought this and I've bought, repainted, and sold a bunch. I stripped it down, repainted it, and made some tricky electronic mods. The stock electronics are gone for the most part. The blade switch is still there just to mess with people, because it doesn't work. 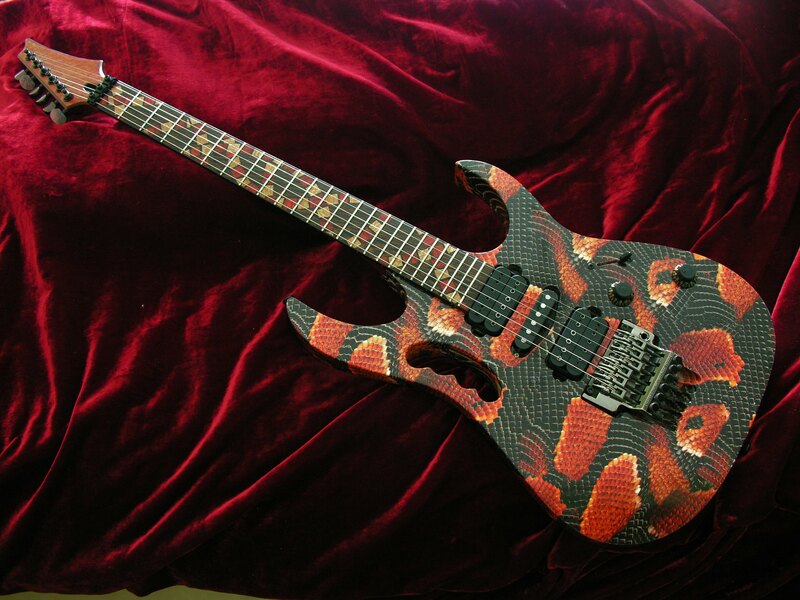 This guitar has been set up with PRS Dragon II pickups and PRS electronics, to include the PRS 5-way switch. The tone knob is fixed to wide open and the middle pup is dead. The tone of this thing is absolutely insane. I cannot tell you the number of guys that have asked me how I get my growly tone out of the Ibanez pups, especially with the blade switch set to the neck position. I would just smile and tell them it's all in the hands. I haven't played this guitar in many years, so if anyone is interested in it, send me a PM. It was made in 2005, in Japan by Team J. Craft and comes with the Prestige Team J Craft case. Last edited by Dychotomy; 02-21-2019 at 03:10 PM. 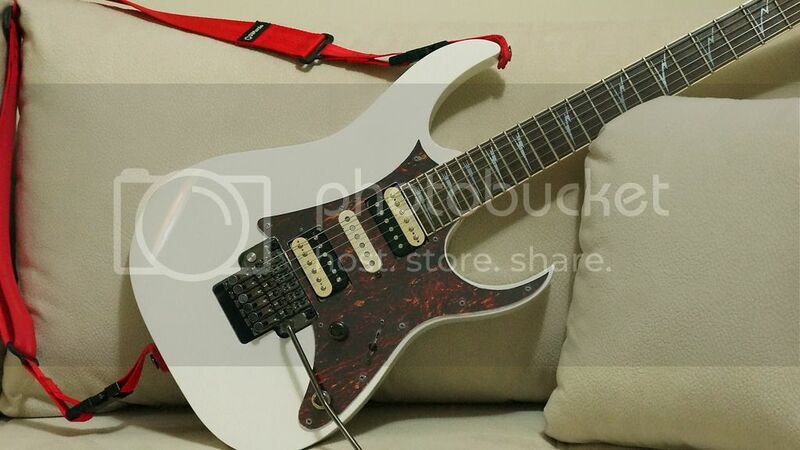 This is my old Ibanez RG1570. 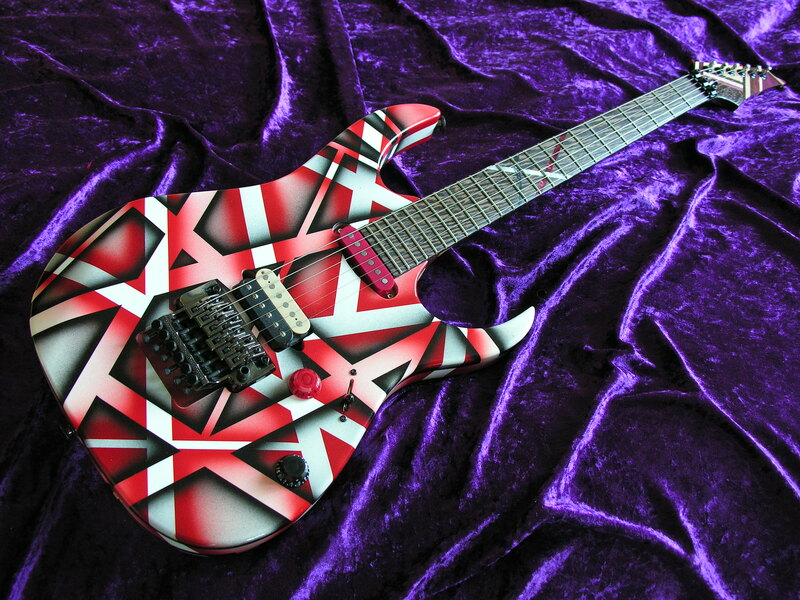 I wanted to refinish this one in kind of a tribute to my favorite guitarist at the time. Normally the Petrucci Picasso has two solid colors. But I was just getting into chameleon paints and decided to paint the Picasso using two different chameleon paint colors. So no matter what angle you are looking at it, you are seeing different colors. Fun project. I didn't really modify anything else. Just the paint.